Management Synergy in the Framework of Quality Improvement in the Doctoral Program in Indonesia was the theme of this year’s Indonesian Management Doctoral Program (APDMI) meeting. 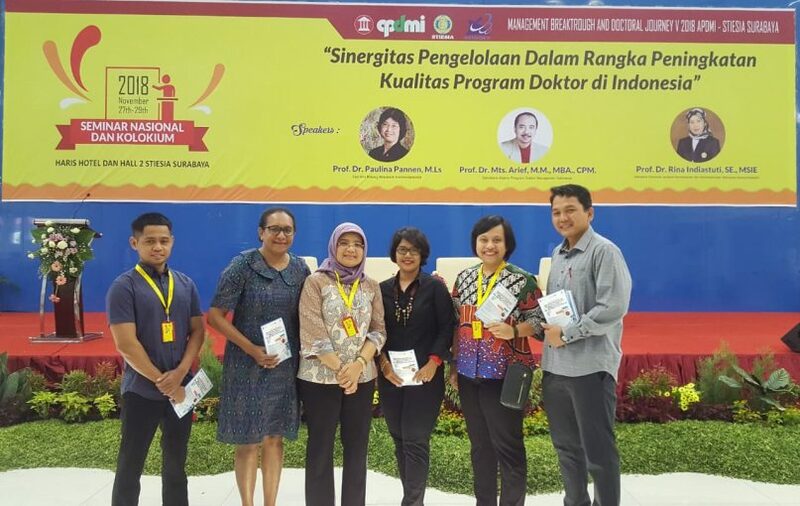 The national seminar and colloquium with management and doctoral program student participants from various universities in Indonesia became the format of the event held at the Indonesian Economic High School (Surabaya). This activity held on 27th -29th November 2018. The main speakers in this forum were Prof. Dr. Mts. Arief, M.M., MBA., CPM. (Secretary of APDMI), Prof. Dr. Paulina Pannen, M.Ls. (Academic Staff of the Ministry of Research, Technology and Higher Education), and Prof. Dr. Rina Indiastuti, S.E., M.SIE. (Secretary of the Directorate General of Learning and Student Affairs, Ministry of Research, Technology and Higher Education). The speakers explained about higher education policies, challenges, opportunities, and their implications for the management of doctoral programs in Indonesia. The Master of Science and Doctoral Program, Faculty of Economics and Business, Universitas Gadjah Mada (MD FEB-UGM) participated in this activity. The delegation from MD FEB-UGM consisted of directors, managers, employees, and doctoral students and was led by Nurul Indarti, PhD as the Directors Management Doctoral Program of Management of FEB UGM. In detail, the MD FEB-UGM delegation was Nurul Indarti, Ph.D. (director), Tur Nastiti, Ph.D. (manager), Tri Widiyanto, S.E. (Head of Finance), Handayani, S.E. (Head of Academic), Quinci Fransiska Kambuaya (Doctoral Management Student), and Linda Ariany Mahastanti (Doctoral Management Student).